Males have longer finnage and richer colours. A peaceful community fish that must be kept in groups of 6 or more. Do not keep with nippy fish or predatory fish. Will take most foods including pellets and flake as well as live/frozen foods such as bloodworm and brine shrimp. Prefers a large and spacious tank with ample swimming room as well as hiding places. Also does better in soft acidic water than hard alkaline water. A peaceful active mid-swimming shoaling fish. Must be kept in groups. 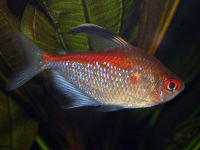 This fish looks very similar to the Bleeding Heart Tetra down to the red spot on the flanks, however this fish also has the top half of the body coloured red also with the rest of the body pale and colourless. The dorsal fin is tipped with black with the rest of the fins colourless.